The Australian-based Speigelworld is like a grungier version of Canada’s Cirque du Soleil presented on a more intimate level. 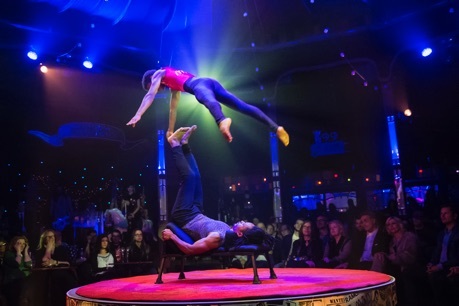 The company stages its shows in a spiegeltent, a type of round, portable venue made of wood and canvas originally created in 19th-century Belgium. The mirrored spiegeltent seats only 700 around a three-meter-round elevated stage. To see circus acts of Cirque du Soleil quality in such close proximity is exciting in itself. Yet, Spiegelworld’s latest show Empire tends to be more exhausting than energizing both because it lacks a coherent concept and because its lows tend to cancel out its highs. When it first opened in New York City in May 2012, Empire apparently had some sort of concept that had to do with the Occupy Wall Street movement. The show’s Host was a once-wealthy impresario trying to raise funds by putting on a show made up of street performers. All that’s left of this concept now is a parade of protest placards and a costume for the Host made of fake dollar bills. Otherwise, Empire has the more the atmosphere of Austria-Hungary than New York State. It feels like a nightclub in some European backwater trying to conjure up the glitz and sleaze of New York without the means to do do. There are songs about New York in the deafening canned music and from the live chanteuse, the steps to the stage referencing New York subway signs and a parade of people holding cheesy skyscraper tops. Of the “street performers” milling about before the show, Angus Strathie’s costumes make the women look like early 20th-century hookers wearing modern high heels while the men are clad in what look like discards from an array of past Cirque du Soleil productions. For a small-scale circus show where the stage performers actually do look like street performers, you should see a show by 7 Doigts de la Main like Traces. Supposedly, Empire “smashes the boundaries of circus, cabaret, variety and burlesque, reinventing the genres for a 21st century audience”. In fact, Empire doesn’t reinvent anything. It is simply a series of circus acts presented in a small venue. Since there is no longer any overarching story or theme, the succession of acts seems just like an old-fashioned variety show. The lingerie-style costumes for the female performers may suggest burlesque, but the circus acts are not burlesque in themselves. The only source of burlesque comes from the emcees/clowns of the show Oscar and Fanny (Don Colliver and Jamie Franta), who are among the least funny, most inept performers I’ve seen for a long time. Their circus act is supposed to be the quick change, but while Franta seems adept at it, Colliver is not. At one appearance, Franta, an American who for unknown reasons has adopts a vaguely East European accent, chooses an unlucky member of the audience to help her do an extremely awkward striptease, followed up with an assault by Colliver’s seemingly pansexual Oscar. The duo’s final routine consists of the them shooting bits of banana from mouth to mouth with rather more misses than hits. To conclude they regurgitate chewn banana mush from mouth to mouth. If Colliver and Franta’s F-bombs and general rude language, genital flashing, suggestive frottage and gross-out behaviour is what makes Empire a show for adults, the show would be much better off without them. There is enough sensuality inherent in the circus acts themselves and that is attractive rather than off-putting. The clowns only lower the tone and the level of expertise every time they appear. Though Oscar and Fanny are nominally the emcees, the show begins without them. The first act is the most unusual featuring New Zealand contortionist Lucia Cabrines suspended in a clear Perspex bubble over the stage. Not only does she contort in incredible ways within the bubble but she uses immense strength to suspend herself in unlikely poses from the halves of the bubble that opens downwards. Of the eight circus acts that follow, three are truly remarkable. One is Russian roller skaters Denis Petaov and Mariia Beseimbetova. This is a case where the small circular stage adds to the feeling of danger as Petaov skates in circles within its perimeter using his momentum to counterbalance Beseimbetova in increasingly more complicated holds. The climax comes when the two are connected only neck-to-neck by a harness with Beseimbetova spinning as she swings out and away from Petaov. Next is a beautifully choreographed adagio act with Ukrainians Vlad Ivashkin and Aiusha Khadzh. Not only does Ivashkin lift, throw and catch Khadzh in increasing dangerous ways, but the two perform hand-to-hand routines where he supports her only with his arms and she uses amazing muscular control to maintain difficult rigid positions. One feat I’ve never seen before involves Ivashkin lying on the stage supporting Khadzh only with his arms who extends herself horizontally over the edge of the stage. It is a wonderful act that blends beauty with strength. The third is what is called a Risley act where Henok Belchew Yazachew, lying in a special chair on his back, flips the smaller, incredibly agile Temegen Adole Zada using only his feet. Zada performs a dizzying number of gymnastic variations of flips, layouts and spins while propelled high in the air by fellow Ethiopian Yazachew. One often sees Risley acts where the base foot-juggles objects. Here, where the object is a person who can also move, the act is infinitely more exciting. Many will be impressed by the final act known as a Sandorrn Balance, where American Andreis Jacobs builds a structure starting from a feather on a small palm branch to that branch balanced on an entire series of ever larger branches. Anyone who has seen Cirque du Soleil’s Amaluna (2012), will already have seen a more complex version of the act performed by Lara Jacobs Eugster, the daughter of the man who invented the act. Unlike Jacobs, Eugster increases the difficulty by using her foot to pass each branch to her free hand. The advantage of the Sandorrn Balance in Empire is that the resulting structure of 14 branches all balanced precariously on top of each other cantilevers over the audience. The disadvantage, especially if you have seen Amaluna, is that the act feels uncomfortably long in comparison with the relatively short acts that have preceded it. The act nevertheless generates a much higher level of concentration in the audience than the earlier acts. One reason is that French guitarist Aurelien Budynek and Canadian singer Tessa Alves confine themselves to creating only a vague soundscape to accompany the act. This contrasts with the overloud songs with lyrics that accompany virtually all the other acts. Lyric actually are a distraction when viewing a circus act because we must intentional blot them out to focus on what the performers are doing. One pleasure of the Risley act is that the musical accompaniment is wordless. One problem with the small stage is that dangerous acts like Yasu Yoshikawa’s inventive routine on both the Cyr and German Wheels, requires four ASMs to descend into the audience to monitor that the apparatus stays on the stage or on the extensions added to it. This breaks the illusion that the artists are performing on their own. 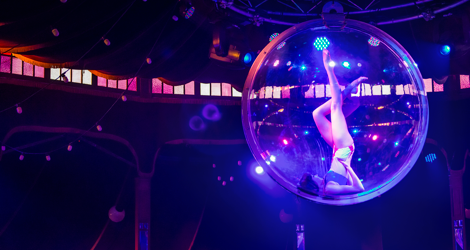 A difficulty with the faux-grittiness that production designer Josh Zangen is seeking is that that atmosphere contrasts too much with the charmingly antique nature of the spiegeltent itself. A production that presented itself as a classy European variety show would be much more in keeping with the venue. Potential patrons should know that the seating in the spiegeltent is not raked but rather ranged in tiers. If you have a seat in the front row of a tier you can see over the heads of those in front of you. If you are in the second or third row in a tier the heads of those in front will obscure the view except for the acts, of which there are many, that take place at a good height above the stage. While the chance to see nouveau cirque acts performed in such close quarters is attractive, too many acts are routine or, in the case of the clowns, actively obnoxious. Since, unlike Cirque du Soleil, there is no plot or theme to hold the acts together or propel a narrative forward, the show really is just a miscellany and not especially compelling as a whole. I was glad to see such performers as Petaov and Beseimbetova, Ivashkin and Khadzh and Yazachew and Zada, but I hope the next Speigelworld show has more coherence and finds some inspiration in the old-fashioned structure where it stages its performances. Photos: (from top) Lucia Cabrines, ©2014 Danielle Covin; Denis Petaov and Mariia Beseimbetova, ©2013 Danielle Covin; Henok Belchew Yazachew (on back) and Temegen Adole Zada (in air), ©2014 Adole Brother.